For you to be the one customers keep coming back to, you need to stay top of mind. You’re always thinking about the leads in your pipeline, and how to stay top of mind. But let’s be honest — how many are thinking about you? 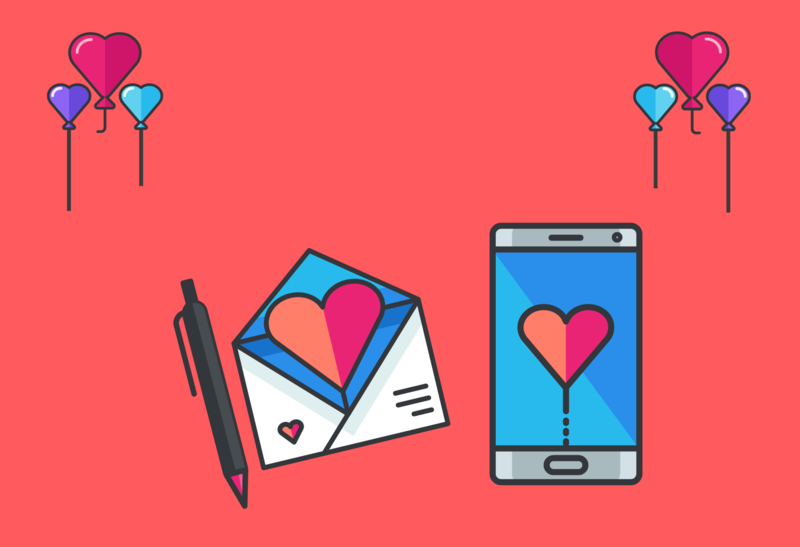 It’s Valentine’s Day and we wanted to give you some ideas on how you can stay top of mind with your leads. There are so many highly effective strategies to draw attention to yourself — we learnt them all in high school. There was the object of your affection leaning against a lucky locker and you would try out a few scenarios to accelerate the infatuation to a concrete affirmation of life long love. Sometimes they even worked. You spoke louder whenever they were in your vicinity, you sneaked treats into their book bag, you always placed yourself in their periphery, you didn’t come on too strong, you sent a few notes to test the lay of the land, you dressed up, you sprayed on the scent and brought your “A” game — you played harder, jumped higher and ran faster to show your best side. These days some of those old charm tactics can be easily applied to staying top of mind with your generated leads, which could lead to hand holding and even the start of a long relationship. They’re called psychological triggers in the adult world of conversion courtship. Perhaps you’ve overestimated your powers of hypnotism or persuasion. In which case it’s time for less psycho and more psychology. Sorry to break the news to you but human beings all respond to the same mental triggers. It’s time to switch them on in your favor and charge your marketing messages with psychological trigger switches. We all are obsessed with gaining pleasure and outrunning pain — it’s what motivates every single action we choose to undertake. Some people, like ocean advocate Lewis Pugh, gain pleasure from speedo swims in the icy water of the North Pole because it highlights vulnerable ecosystems — which is his life’s purpose. For many others that would be a torturous experience. When you know what really drives a specific person in their pleasure response we can speak to them in their own language. Like when you started religiously watching the sport your crush was involved in so you could make their obsession yours too. (You know you did that). Once you know who they are you can speak to their needs. You have to give your leads the roadmap of how they are going to get from where they are — to where they want to be. Your marketing goal is to show them clearly how to get to their final step. You offer the milestones in between and they take pleasure from your brand journey that keeps giving. We are triggered by reciprocity — when you receive, you like to give back in return. You want to dangle the carrot. Something free but also valuable. The scarcer the item the more intense the appeal. It creates an urgency. We basically want what we can’t get. (sounds familiar?) But this doesn’t have to be an unrequited product love-story. You entice with producing a “limited edition” of your offering or create urgency with messaging that says, “Only 6 left in stock”. We go to great lengths to dodge pain. We spend more time on it than actually trying to increase our pleasure. Neurologically — our brains actually light up way more from negative external stimuli than from positive stimuli. So, if you can show your targeted lead how you are going to solve a real pain spot for them — their brains will literally set off a fireworks display of relief and they will buy your offer. Many tiny accumulated yeses. They get in the habit of saying “yes” to you and by the time they get to the checkout, the big buy-in “Yes” is easy for them to do. If a “no” seems to rear its ugly head — retarget. As Adele sings the retargeting anthem, “Don’t you remember, the reason you loved me before” in the background. You want to be seen as the cool kid. You need to ensure your social cred. Your lead wants social proof of your status. We act in packs. So, leverage your social media positive ratings, celebrity endorsements, testimonials to the max to spread the word that they will be in good company when they hang with you. Our substantia nigra/ventral tegmental or midbrain regulates our motivation, new information and reward processing. It likes novelty way more than the familiar. It regulates our Dopamine levels which regulate our emotional responses towards taking action around rewards. It’s the molecule behind our secret cravings. So, when we use novelty our brains go into overdrive imagining the reward lying in wait for us just around the corner. We are instantly motivated to seek out this pleasure. That’s why every year you release a new model/version/upgrade/update or rebrand. “New” paired with “scarcity” are a highly attractive couple. The rational brain is always searching for answers, for meaning. When you offer a reason for your actions, an explanation, people are willing to do more for you. Their action has meaning. Tell your leads about your offer and exactly what they will be getting out of it. Explain why you are offering them this opportunity clearly and your leads will want to comply with your ask of them. We all love a good story. As Nigerian novelist Ben Okri says, “we are part human, part story.” We get emotionally triggered by a story that tugs at our heartstrings. They also trigger our senses and we are transported to other worlds on the wings of words. Our emotional brains ignite like Christmas tree lights when we “buy” a good story. So tell a great one. We always gravitate to the easiest solution. Your lead doesn’t want to have to jump to many hurdles — they want the least demanding course of action. It’s the “law of least effort.” Show your lead the fastest route to their ideal result. We love the words easy, fast, step-by-step, quick. When we get curious we want to learn more and we leap into action. Teasers spark the need to know more. Let your marketing content pique curiosity levels — maybe even with a little mild controversy. I See You Shiver in Antici…pation! There is nothing nicer than the tingle of joy at the thought of an upcoming event. We can just imagine ourselves in the situations and we get excited from the anticipation. By having something to look forward to we actually bring massive happiness into our existence on the planet. That’s why campaigns that build excitement around the launch of a new product trigger happy emotions in your potential customers. They are now waiting in anticipation because you have told them something wonderful is on the horizon. Announce months ahead of time and get the right influencers to get excited about it too, promoting it on their channels. Make your leads feel super significant. Tell them they knock your socks off. Reward them, make them feel valued. Authentically care for your leads and they will become lifelong partners. Let them know they really are number one to you. Community is an essential drive in all of us. It makes us feel secure when we are part of a larger circle. Invite your lead to join in the group. Your tribe will then promote your business because they are 100% behind the vision. They feel included. Keep trying to make a lasting impression. Make sure your particular style aligns with the powerful principles of neuro-aesthetics — “devised techniques and resources that catch our attention, interest us, and appeal to us because they engage certain neural processes related with rewarding sensations.” We are obsessed with the visual and when marketing messages are designed using Neuro-Design they speak directly to the brain and trigger engagement. All of these approaches are to keep you memorable, stay top of mind, tip of the tongue and hot off the press. You want your leads to sing Ariana Grande’s, “I’ve been thinking about you” at the top of their lungs every day. Push those psychological trigger buttons as often as you can and watch your leads convert. What other ways do you try and stay top of mind? Share in the comments below! Thanks for sharing this! This is a really cool and fun way of breaking this down in section or scenarios, it simplifies the process to be understood easier by people new to marketing. Great post, Randi!